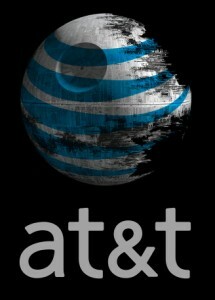 I have been an AT&T customer for quite a few years and I have rarely had a bad word to say about them. I have rarely experienced anything other than pretty good service from them. Their prices have never seemed too bad for our needs either. We have a grandfathered ‘unlimited’ data plan as well as a couple of tablet plans. I get a decent corporate discount too. I often read about the ‘evil empire’ and their terrible service, but apart from a couple of local ‘low signal’ spots I rarely have a phone that does not work. Virtually without fail AT&T have managed to resolve my issues, usually first time too. I therefore often do not understand the hate that seems to be directed to them. Last night Dom came over, in need of a loaner phone. He is on T-Mobile and he is not due for an upgrade until March. He is also a Blackberry user and for reasons that are probably more related to RIM’s declining quality, they barely last ‘five minutes’. It seems that he is constantly complaining that his phone is broken. Last night his Phone was showing a serious screen issue, only the left hand ¼ of the screen was showing anything other than something that looked like TV noise. I tried the usual BB things, swear at it, pulling the battery, slamming it against the wall and threatening it with violence – none of this worked. So I dug through my phone drawer and found an older heavily modified HTC Aria – this is running Cyanogenmod 7 and is a great little phone. Sticking his TMO SIM card in required that we typed in the SIM unlock code. Which we did not have – so after a swift Google I called AT&T and spoke to a tech support operative. She was able to ask around and then eventually come up with an unlock code. She was super nice through the entire 40 minute call and honestly apart from how long it took, I have nothing bad to say. Once more they came through for me. I really do not understand the animosity towards them…. Dear Hollywood Why I am sick of Samsung Android devices….